To determine your general topic, you will need to conduct some presearch. Google Scholar is an excellent tool to use for this stage in the process. A search in Google Scholar will provide a broad scope of the literature landscape. You can also get an idea of the essential researchers in your area of interest. Bonus: you will be able to see a full-text link for items you can find at Riley Library! Click on the link below for instructions on setting up Google Scholar to display NNU results. Search thousands of journals in all subject areas, many in full text. Mark results and save, email, print, or add to Zotero. Gateway to all ProQuest databases. All subject areas. Contents includes articles, books, dissertations, company profiles, and ebooks. Provides free online access to official publications from all three branches of the Federal Government including Presidential Documents, the Congressional Record, Congressional Bills, the Federal Register, and more. Law journals, state and federal laws & court cases, U.S. and world news. Military & Government Collection Description of this database. Many databases are interdisciplinary in nature. So don't judge a database by its title. PsycINFO and SocINDEX, for example, both have coverage of counseling, education, and health science journals as well as social work and psychology. Get to know the databases in your area of study. Use the "shotgun" approach. Start broad and refine. Don't worry about being too specific to start. Use a "Last is first" strategy. Find the newest research first. Then work your way backward. This will help you detect patterns in the literature regarding landmark studies and important themes and researchers. Look for "Theory" articles. Theoretical articles that relate directly to your topic are prime material for your literature review. Look for "Review" articles. Review articles can give you an idea of overall landscape associated with the literature. Use Google Books to search for textbooks or other related books. The full book might not be available but indexes usually are. Locate the seminal or landmark studies. Make sure it is the original study and *not* someone else's ideas about the study. Adjust the length of your reference list as needed. Consider using unpublished studies. Search for the vitae of researchers that interest you. These can often be found on the websites of the institution (school, professional organization, think tank, etc.) they are associated with. Don't be afraid to contact researchers and authors directly. They are usually working as faculty at another university and are accustomed to being contacted for a copy of the survey tool they used or conference papers. They are often helpful and can provide leads to other sources. 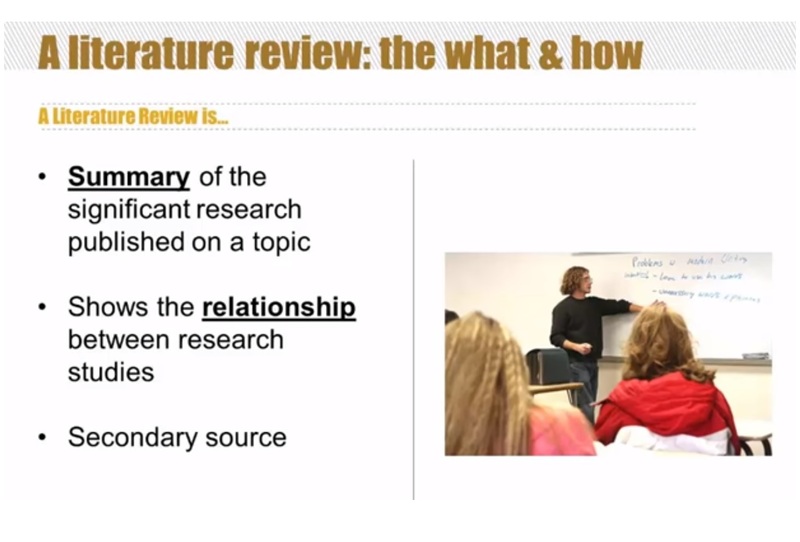 Below are some links to help you as you write your literature review. A short and handy resource from the University Library at UC Santa Cruz. Opens a PDF. This is a sample paper with instructor notes that explains the writer's process. 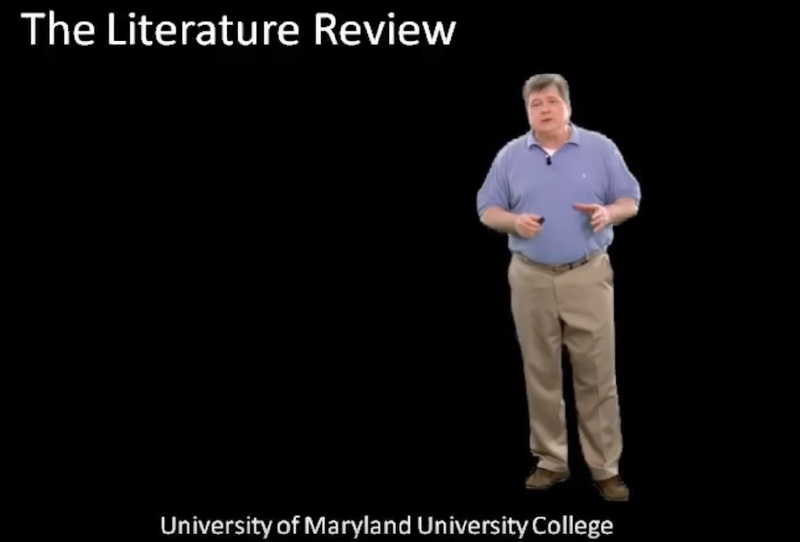 View these video tutorials to aid you as you refine your literature review.